Analysis: At Davos, Darker Mood Awaits Meeting Of Global Elites Last year, the Davos scene was marked by grand entrances and ambitious power politics. But this year, the power of several word leaders is in decline and the global economy is shaky. President Trump speaks during the World Economic Forum in Davos, Switzerland, on Jan. 26, 2018. He became the first U.S. leader to visit the annual gathering in 18 years. Davos is where world leaders preen and articulate grand visions in a glamorous setting that beckons with powdery snow and shiny klieg lights. The annual meeting, high in the Swiss Alps, is the ultimate gathering of the global elite. Last year, the Davos scene was marked by grand entrances and ambitious power politics. President Trump became the first U.S. leader to visit in 18 years. Prime Minister Narendra Modi became India's first leader to speak at Davos in two decades. The leaders of the world's two largest democracies had swagger, arriving with large entourages of top officials. A year later, many of the same leaders who preened in 2018 are licking their wounds in a world where the outlook seems a bit darker and economic fears are rising. 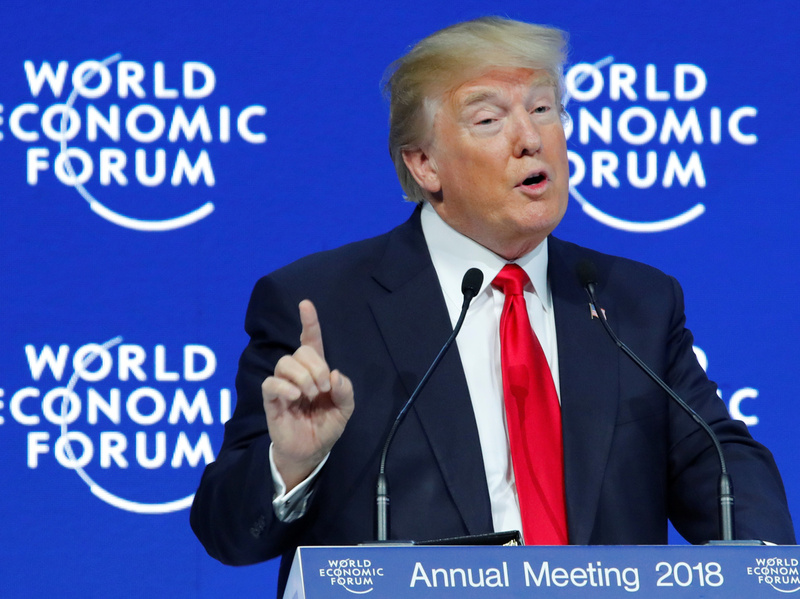 Last year, Trump delivered the keynote address at the annual gathering of the World Economic Forum. He had just completed a year as CEO of America and leader of an economic superpower. He had reason to feel good, having scored a big victory, marshaling a massive tax cut package through Congress. The stock market had been giving him a big thumbs-up with massive gains for over a year. In two weeks, Trump heads to Davos as the leader of a country where the government has shut down. His party suffered a bruising defeat in the elections, ceding power in the House of Representatives. The stock market has in recent weeks had the kind of roller-coaster ride that would make even a seasoned participant sick — with the Dow teetering, often by as much as 800 points on a single day. India's prime minister, meanwhile, last year talked about the importance of global ties and highlighted India's democratic edge over China. Modi had reason to feel confident. The party he leads held power in almost every major state in India. But things have shifted. And not in his favor. His Hindu nationalist party suffered an embarrassing defeat in three state elections in December. Modi and Trump are not alone in facing the winds of change. Fresh from electoral victory in his own country, France's President Emmanuel Macron last year gave one of the longest speech among world leaders. It lasted about an hour and was delivered in both English and French. His message to Davos was simple: France is back. When he ended, he was greeted by a standing ovation. Today, what's back in France are images of revolt. A "yellow vest" rebellion has overtaken the streets of Paris, and the wide boulevards of the Champs-Elysees have become the scene of torched cars. While riding high last year, Macron said that the country's rigid rules need to be more flexible. He pledged to make France "a model in the fight against climate change." This year, with the streets ablaze, Macron gave into the demands of protesters, scrapping a controversial gas tax. His favorability ratings have plummeted. Last year, Britain's leader, Prime Minister Theresa May was already facing trouble. She offered none of Macron's soaring optimism; attendees were reported leaving the hall even before her speech ended. Now May's life is even tougher. Just weeks ago, the Brexit process devolved into chaos after a deal May had negotiated with the European Union led to members of a her own party triggering a vote to unseat her as its leader. She survived it. So, the annual gathering of the World Economic Forum is happening at a time when many leaders are facing challenges to their might. That usually leads them to focus inward rather than outward, not something that the global elite wants to see. The other overriding issue: The world economy is starting to look a little shaky. Even though the U.S. economy is still riding high — with low unemployment and employers on a hiring spree — some other parts of the globe aren't looking so good. For instance, in the third quarter, the economies of eurozone powerhouse Germany and also the world's third-largest economy Japan had contracted. Then last week, Apple starkly warned of weak iPhone sales and this week, rival Samsung said profits will fall by nearly a third, stoking fears over the health of the global economy and the effects of the bruising trade battle between the U.S. and China. All this has rattled financial markets greatly. A global slowdown is the last thing a meeting of globalists wants on the agenda. Trump has confirmed he is going to Davos. It's unclear if any of these other leaders will, given how different their world feels. The winds have shifted. Pallavi Gogoi is NPR's chief business editor.